Transfer from JFK Airport to Manhattan is best arranged before you travel to New York. You can travel from JFK Airport to Manhattan by a taxi, bus, shuttle, subway or train. There are many options so you’ll always find one that suites your needs and budget whether you’re travelling alone or in a group. Are you travelling to New Jersey, Brooklyn, Queens or The Bronx, click here. For JFK to Long Island City transfers see here. Legal yellow cabs (taxis) can be found in long queues at every terminal. A taxi ride from JFK Airport to Manhattan costs $52 and you will have to pay up to $8 for tolls and $0.80 for state tax, plus a New York State Congestion Surcharge of $2.50 for all trips that pass through or end in Manhattan south of 96th Street. On weekdays between 16:00 and 20:00 a rush hour surcharge of $4.50 is calculated. In addition, it is customary to tip the driver $7 to $10. You will agree the total amount for the trip from the driver prior to boarding the taxi. One yellow cab fits three people with luggage. If you’re travel with four people or more, you can book your transfer here. Beware of taking a gypsy cab. Gypsy cab drivers sometimes wait for passengers in the Arrivals Hall, don’t use them! These shared shuttle buses will take you directly to the hotel or private residence where you are staying. It’s good to know that most buses only go to up to 125th Street in Manhattan. The ride from JFK Airport to Manhattan costs $20. These buses are cheap and very easy to use, but they take longer than a taxi as they have to drop off several people. Book your seat on the shuttle bus before you go. You will get a voucher via email that you have to print out. 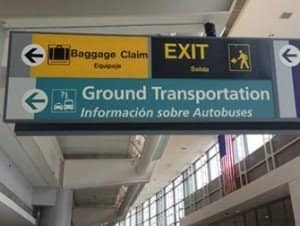 You will find the shuttle buses at “Ground Transportation” at every terminal in JFK. Shared small shuttle buses run all day and all night, so don’t worry if you arrive later than planned. NYC Express Bus provides shuttle buses between JFK Airport and Manhattan. The buses run approximately every 30 minutes between 11:00 and 19.00 and they stop at Grand Central, Times Square and Port Authority in Manhattan (you can choose which stop and there is no price difference). Children under 5 travel for free. Most buses also have free internet so you can email home immediately. The AirTrain runs in both directions from JFK Airport to either the Howard Beach or Jamaica subway stations for $5. From there, you can transfer to either the A or E subway line to reach Manhattan for just $2.75. This connection takes about 1.5 hours and if you are travelling with a lot of luggage after your long flight, then travelling this way is not recommended. Total cost is $7.75 + $1 for the MetroCard. The train connects the JFK AirTrain with Penn Station. The total ride costs $10. To get to the train you will need to take the AirTrain first (cost $5). The AirTrain will take between 15 and 25 minutes to get to the train station. The train ride to Manhattan’s Penn Station takes about 20 to 30 minutes. If you do not want to take a taxi, take a shuttle bus or limo instead. Are you travelling from a different airport?